There are cool places ... and then there are coooooool places. 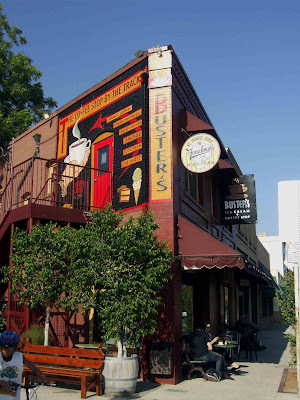 Busters is a great combination of hip as well as timeless. Bogart might as well be sitting on that bench, pulling down his fedora to block the sun. This is where Ethan Hawke and Julie Delpy would have chatted if they'd been in Southern California instead of Vienna. Grab a great cup of coffee, a Fosselmans ice cream cone, and a nifty view of Thursday's Farmer's Market. If you take the Gold Line, just get off at Mission and walk across the street. Thanks a bunch 4 your camera info. I gotta get one soon for my "textbook" blog! Greaty place to relax with some ice cream. I was just there a week ago last Sunday with a mint chocolate chip ice cream.... MMMMMmmmmmmmm. Glad to find your blog! South Pas was my first choice when looking for a home. life observer, I'll have to look into Heirloom Cafe for sure. What's your textbook project? Shirtees -- dave/anna, I love your blog! This looks like a place I would love to hang out in. great shot! Is that Buddy Holly playing on the radio?